Microsoft Excel can be tough to use. But you don’t need to be a spreadsheet jockey to get the most out of Excel 2016. Just follow these three tips, which work in Excel 2019 as well. Microsoft Windows may get all the press coverage, but when you want to get real work done, you turn your attention to the applications that run on it. And if you use spreadsheets, that generally means Excel. 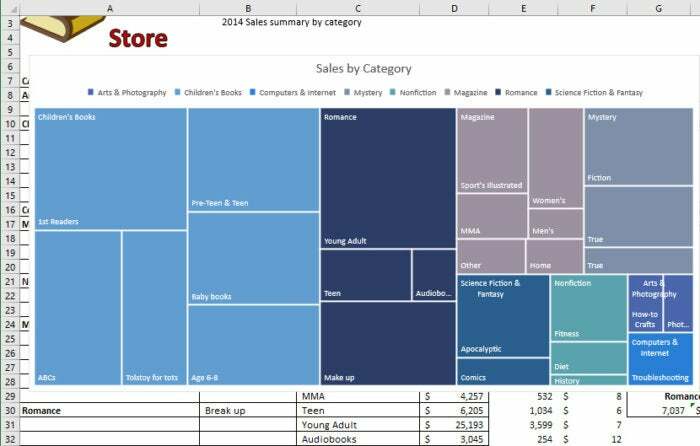 Excel is, of course, part of Microsoft’s Office suite of productivity tools. Microsoft sells Office under two models: Individuals and businesses can pay for the software license up front and own it forever (what the company calls the “perpetual” version of the suite), or they can purchase an Office 365 subscription, which means they have access to the software for only as long as they keep paying the subscription fee. 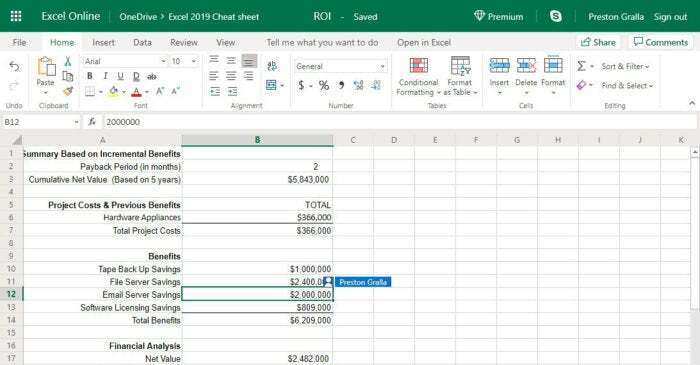 This cheat sheet gets you up to speed on the features that were introduced in Excel 2016 and Excel 2019, the perpetual-license versions of Excel included with Office 2016 and Office 2019, respectively. In Office 365, Excel has all those features, plus several more. Coming soon, we’ll have a separate cheat sheet that covers the latest features in Excel for Office 365. Most of the tips in this article apply to both Excel 2016 and 2019 for Windows. 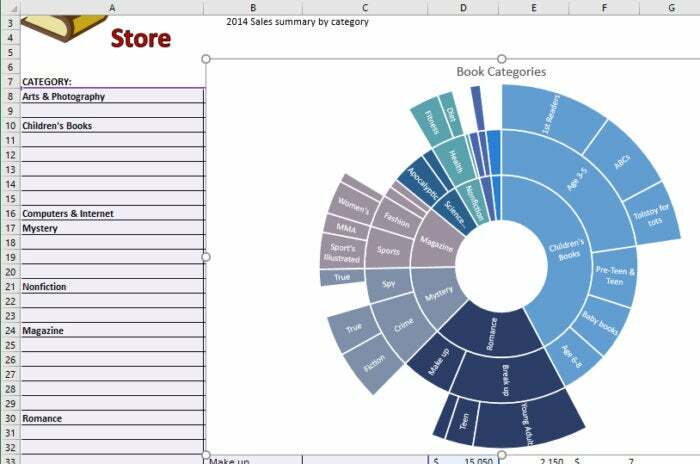 Near the end is a section for Excel 2019 only. Share this story: IT folks, we hope you'll pass this guide on to your users to help them learn to get the most from Excel 2016 and 2019. The Ribbon interface that you came to know and love (or perhaps hate) in earlier versions of Excel hasn’t changed much in Excel 2016 or 2019. Since the Ribbon has been included in Office suite applications since Office 2007, we assume that by now you’re familiar with how it works. If you need a refresher, see our Excel 2010 cheat sheet. As in Excel 2013, the Ribbon in Excel 2016 and 2019 has a flattened look that’s cleaner and less cluttered than in Excel 2010 and 2007. The 2016 and 2019 Ribbon is smaller than it was in Excel 2013, the title bar is solid green rather than white, and the text for the Ribbon tabs (File, Home, Insert and so on) is a mix of upper- and lowercase rather than all caps. But it still works in the same way, and you’ll find most of the commands in the same locations as in earlier versions. To find out which commands reside on which tabs on the Ribbon, download our Excel 2016 and 2019 Ribbon quick reference. Also see the nifty new Tell Me feature described below. Just as in previous versions of Excel, if you want the Ribbon to go away, press Ctrl-F1. To make it appear again, press Ctrl-F1 and it comes back. Auto-hide Ribbon: This hides the entire Ribbon, both the tabs and commands underneath them. To show the Ribbon again, click at the top of PowerPoint. Show Tabs and Commands: Selecting this shows both the tabs and commands. And if for some reason that nice green color on the title bar is just too much for you, you can turn it white or gray. (In Excel 2019, there’s also a black option.) To do it, select File > Options > General. In the “Personalize your copy of Microsoft Office” section, click the down arrow next to Office Theme, and select Dark Gray or White (or Black) from the drop-down menu. To make the title bar green again, instead choose the “Colorful” option from the drop-down list. Just above the Office Theme menu is an Office Background drop-down menu — here you can choose to display a pattern such as a circuit board or circles and stripes in the title bar. There’s a very useful feature in what Microsoft calls the backstage area that appears when you click File on the Ribbon: If you click Open or Save As from the menu on the left, you can see the cloud-based services you’ve connected to your Office account, such as SharePoint and OneDrive. Each location now displays its associated email address underneath it. This is quite helpful if you use a cloud service with more than one account, such as if you have one OneDrive account for personal use and another one for business. You’ll be able to see at a glance which is which. 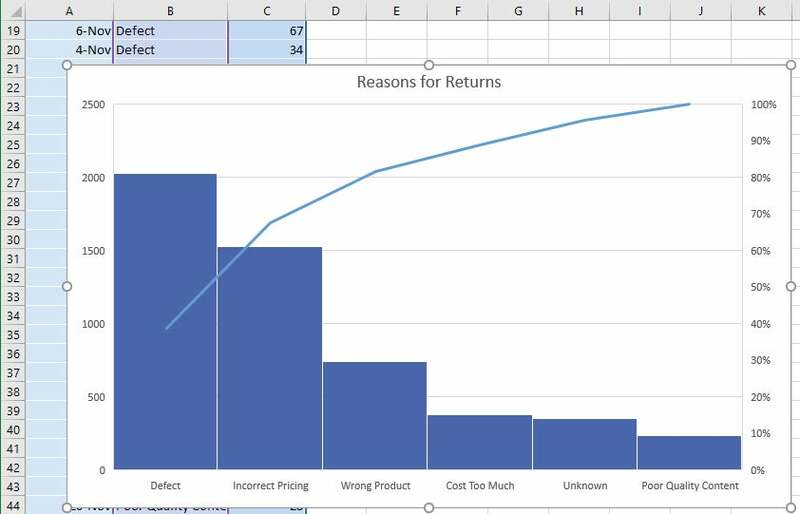 Excel has never been the most user-friendly of applications, and it has so many powerful features it can be tough to use. Microsoft has made it easier with a feature in Excel 2016 and 2019 called Tell Me, which puts even buried tools in easy reach. To use it, click the “Tell me what you want to do” text to the right of the View tab on the Ribbon. (Keyboard fans can instead press Alt-Q.) Then type in a task you want to do, such as “create a pivot table.” You’ll get a menu showing potential matches for the task. In this instance, the top result is a direct link to the form for creating a PivotTable — select it and you’ll start creating the PivotTable right away, without having to go to the Ribbon’s Insert tab first. Even if you consider yourself a spreadsheet jockey, it’ll be worth your while trying out Tell Me. It’s a big time-saver, and far more efficient than hunting through the Ribbon to find a command. Also useful is that it remembers the features you’ve previously clicked on in the box, so when you click in it, you first see a list of previous tasks you’ve searched for. That makes sure that tasks that you frequently perform are always within easy reach. And it puts tasks you rarely do within easy reach as well. Another new feature, Smart Lookup, lets you do research while you’re working on a spreadsheet. Right-click a cell with a word or group of words in it, and from the menu that appears, select Smart Lookup. When you do that, Excel uses Microsoft’s Bing search engine to do a web search on the word or words, then displays definitions, any related Wikipedia entries, and other results from the web in the Smart Lookup pane that appears on the right. Click any result link to open the full page in a browser. If you just want a definition of the word, click the Define tab in the pane. If you want more information, click the Explore tab in the pane. For generic terms, such as “payback period” or “ROI,” it works well. But don’t expect Smart Lookup to research financial information that you might want to put into your spreadsheet, at least based on my experience. When I did a Smart Lookup on “Inflation rate in France 2016,” for example, I got results for the UEFA Euro 2016 soccer tournament, and other information telling me that 2016 was a leap year. And when I searched for “Steel output United States,” Smart Lookup pulled up the Wikipedia entry for the United States. 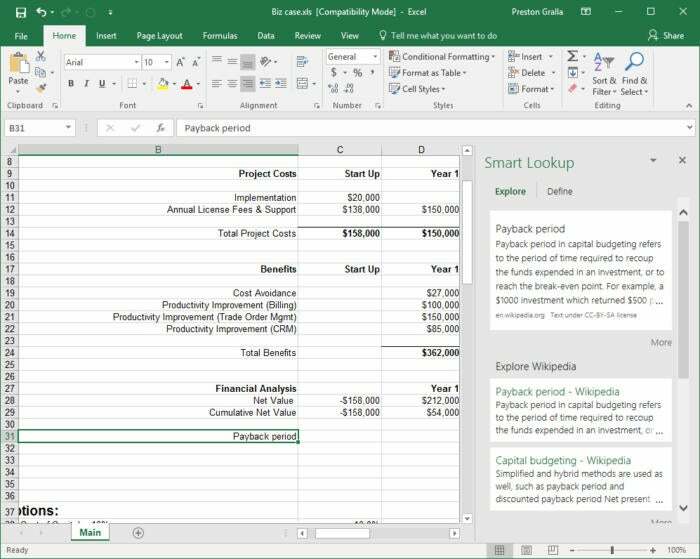 Note that in order to use Smart Lookup in Excel or any other Office app, you might first need to enable Microsoft’s intelligent services feature, which collects your search terms and some content from your spreadsheets and other documents. (If you’re concerned about privacy, you’ll need to weigh whether the privacy hit is worth the convenience of doing research from right within the app.) If you haven’t enabled it, you’ll see a screen when you click Smart Lookup asking you to turn it on. Once you do so, it will be turned on across all your Office applications. 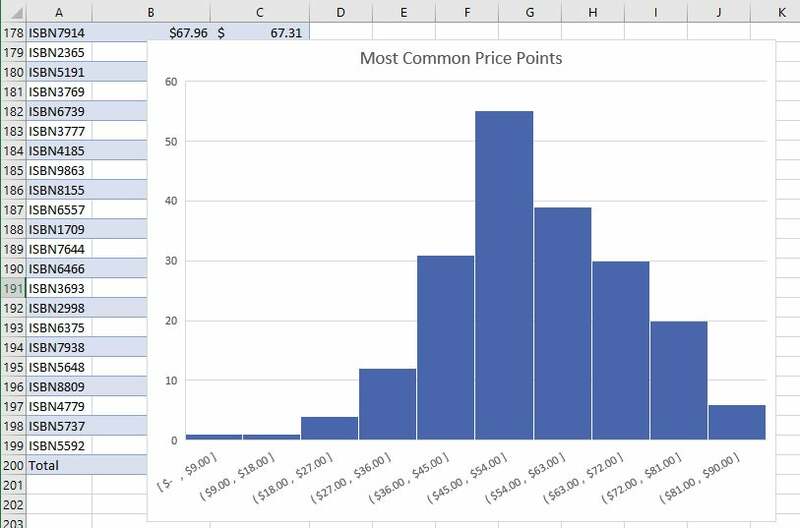 Spreadsheets aren’t just about raw data — they’re about charts as well. Charts are great for visualizing and presenting data, and for gaining insights from it. 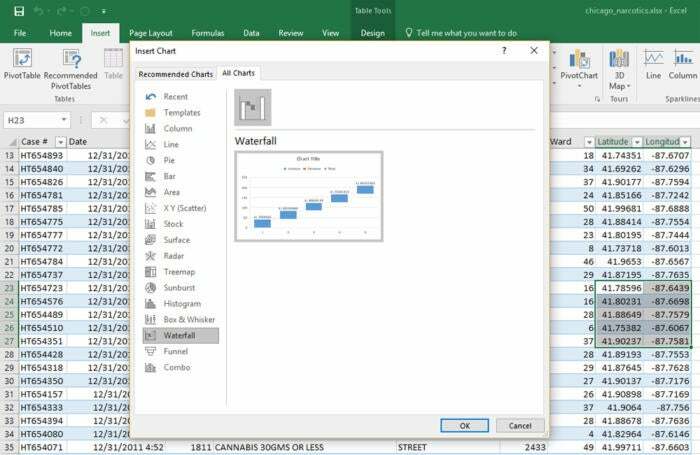 To that end, Excel 2016 has six new chart types, including most notably a histogram (frequently used in statistics), a “waterfall” that’s effective at showing running financial totals, and a hierarchical treemap that helps you find patterns in data. (Excel 2019 has two more new chart types, which we'll cover later in the story.) Note that the new charts are available only if you’re working in an .xlsx document. If you use the older .xls format, you won’t find them. To see all the new charts, put your cursor in a cell or group of cells that contains data, select Insert > Recommended Charts and click the All Charts tab. You’ll find the new charts, mixed in with the older ones. Select any to create the chart. Treemap. This chart type creates a hierarchical view of your data, with top-level categories (or tree branches) shown as rectangles, and with subcategories (or sub-branches) shown as smaller rectangles grouped inside the larger ones. Thus, you can easily compare the sizes of top-level categories and subcategories in a single view. For instance, a bookstore can see at a glance that it brings in more revenue from 1st Readers, a subcategory of Children’s Books, than for the entire Non-fiction top-level category. Sunburst. This chart type also displays hierarchical data, but in a multi-level pie chart. Each level of the hierarchy is represented by a circle. The innermost circle contains the top-level categories, the next circle out shows subcategories, the circle after that subsubcategories and so on. Sunbursts are best for showing the relationships among categories and subcategories, while treemaps are better at showing the relative sizes of categories and subcategories. Waterfall. This chart type is well-suited for visualizing financial statements. It displays a running total of the positive and negative contributions toward a final net value. Histogram. This kind of chart shows frequencies within a data set. It could, for example, show the number of books sold in specific price ranges in a bookstore. Pareto. This chart, also known as a sorted histogram, contains bars as well as a line graph. Values are represented in descending order by bars. The cumulative total percentage of each bar is represented by a rising line. In the bookstore example, each bar could show a reason for a book being returned (defective, priced incorrectly, and so on). The chart would show, at a glance, the primary reasons for returns, so a bookstore owner could focus on those issues. Note that the Pareto chart does not show up when you select Insert > Recommended Charts > All Charts. 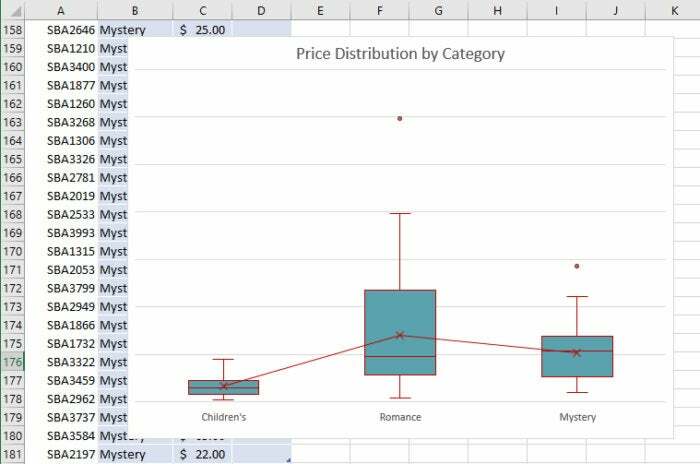 To use it, first select the data you want to chart, then select Insert > Insert Statistic Chart, and under Histogram, choose Pareto. Box & Whisker. This chart, like a histogram, shows frequencies within a data set but provides for a deeper analysis than a histogram. For example, in a bookstore it could show the distribution of prices of different genres of books. In the example shown here, each “box” represents the first to third quartile of prices for books in that genre, while the “whiskers” (the lines extending up and down from the box) show the upper and lower range of prices. Outliers that are priced outside the whiskers are shown as dots, the median price for each genre is shown with a horizontal line across the box, and the mean price is shown with an x. When Office 2016 was released, the most trumpeted new feature was real-time collaboration that let people work simultaneously with each other on documents no matter where they were, as long as they had internet connections. (Microsoft calls this “co-authoring.”) When you collaborate with others live, everyone with access to a document can work on it simultaneously, with everyone seeing what everyone else does as they edit. But Excel was left out in the cold for live collaboration. Only Word, PowerPoint and OneNote had that feature, with Microsoft saying that at some undetermined time, Excel would be given live collaboration. Many people (myself included) expected that Excel 2019 would get co-authoring features, but that’s not the case. To get live collaboration in the Excel desktop client, you have to be an Office 365 subscriber. Perpetual-license Excel 2016 and 2019 users can, however, collaborate live using the web-based version of Excel, and I’ll show you how to do that here. 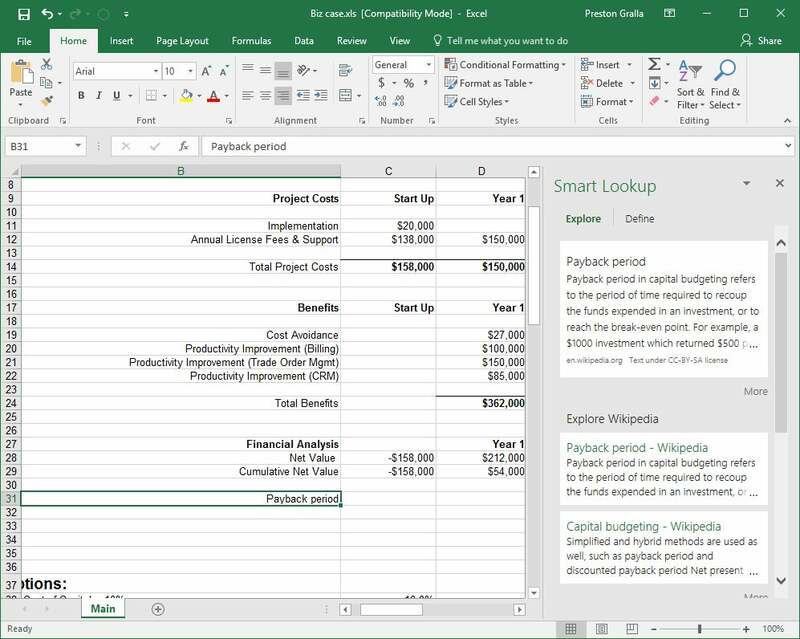 Excel Online is less powerful and polished than the Excel desktop client, but it works well enough if you want to collaborate in real time. To collaborate using the online version of Excel, the file you want to share needs to be in OneDrive, OneDrive for Business, SharePoint or Dropbox. 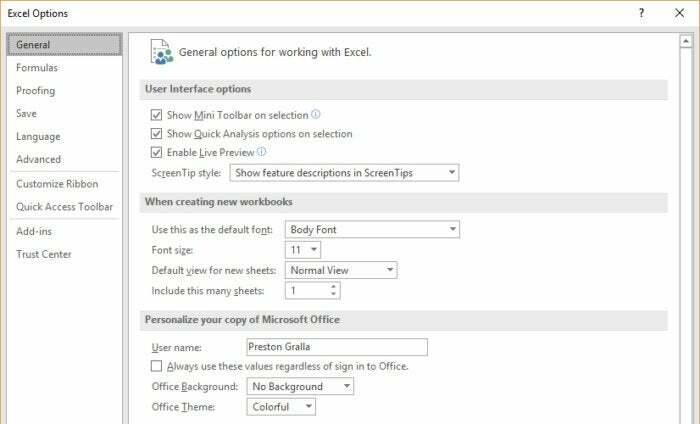 To start, head to Excel Online by going to office.com; then sign in using your Microsoft ID and click the Excel button. When Excel runs, open the file you want to share. Next, click the Share button at the top right of the screen. A screen pops up over Excel. In it, enter the email address of the person with whom you want to share. If you want to share with more than one person, enter multiple email addresses. Then type in a note if you want. If you’re signed in with an individual Microsoft account, the people you share the document with can edit the document by default; however, you can give them read-only access instead by clicking the “Recipients can edit” link under the “Add a quick note” area and choosing “Recipients can only view” from the drop-down list. When you do that, you’ll also see an option to designate whether recipients need to be signed in with a Microsoft account to see the workbook. When you’re ready, click the Share button. When you’re done, a screen pops up confirming to whom you’ve sent the email, and whether they can edit or only read the document. You can click that drop-down to change their permissions or stop sharing the workbook. On this screen you can also send another email to share with others, by clicking the “Invite people” link in the left pane. When you’re done with the screen, click Close. If you’re signed in with a corporate account, the process is slightly more streamlined. On the initial pop-up screen where you enter recipients’ emails, you’ll see a box that says, “Only the people you specify who have this link can edit.” Click it and you’ll see a screen with more sharing options, including anyone, people in your organization, and people with existing access. There’s also a checkbox to allow them to edit the workbook or not. Make your selections and click Apply. Then, back on the first pop-up, click Send. Excel now sends an email to all the people with whom you want to collaborate. 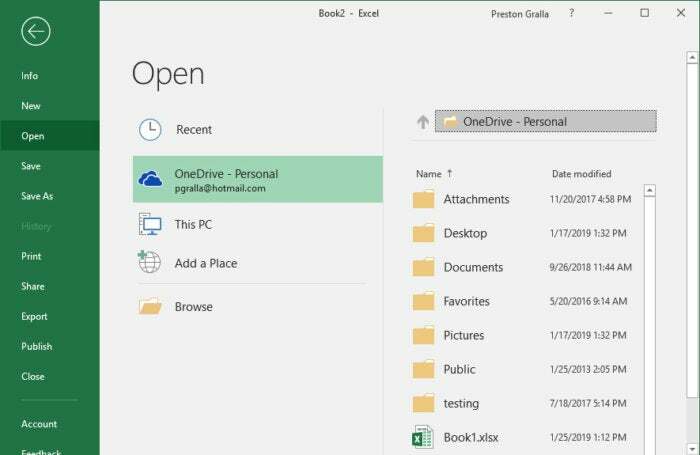 When they click the “View in OneDrive” or “Open” button, they’ll open the spreadsheet. At this point, they can view the spreadsheet, but not edit it. To edit it, they need to click the Edit in Browser button at the top of the screen or click the Edit Workbook menu and select Edit in Browser. They can then edit the document right in their browser window. Everyone using the document sees the changes that other people make in real time. Each person’s presence is indicated by a colored cursor, and everyone gets a different color. As they take actions, such as entering data into a cell or creating a chart, their work instantly appears to everyone else. On the upper right of the screen is a list of everyone collaborating on the document. Click a name to see the location of the cell they’re currently working on (for example, G11). You can also hover your mouse over someone’s colored cursor and see their name. Chat isn’t available. But if you click the Skype icon on the upper right of the screen, you can launch Skype, see if they’re on the service, and communicate with them that way. Note that even the owner of the workbook must be using Excel Online in order to collaborate in real time. If you have the workbook open in a perpetual version of the Excel 2016 or 2019 desktop client, no one else will be able to make changes in their browser; they’ll see a message saying the file is locked. If you’re using Excel Online, everybody can make changes (assuming you’ve given them editing privileges). When everybody is done making changes and no longer has the workbook open in their browser, you can reopen the file in the Excel 2016 or 2019 desktop client.